A car burst into flames after crashing and rolling over in Ventura on Sunday, April 26, 2015. VENTURA, Calif. (KABC) -- A Good Samaritan helped save the life of a driver who was seriously injured in a fiery crash in Ventura early Sunday. Ventura firefighters arrived at the scene on the 33 Freeway near Stanley Avenue around midnight. 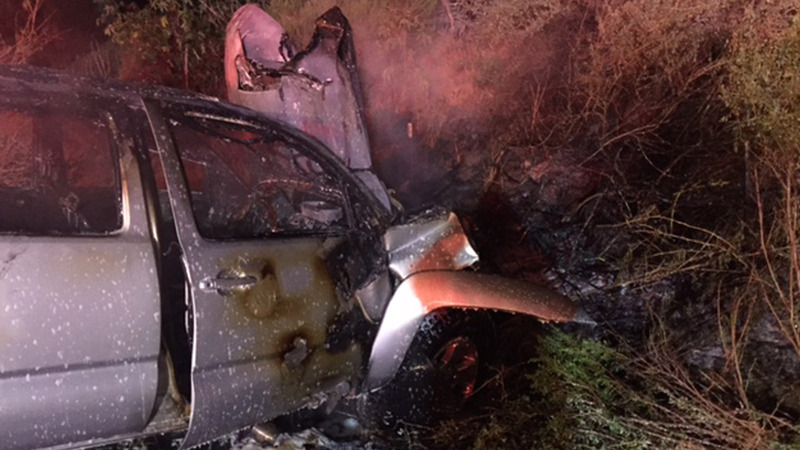 The vehicle had rolled and caught fire, and the flames spread to nearby brush. A bystander rescued the trapped driver out of the vehicle before help arrived. Firefighters put out the fire and treated both the driver and bystander. The driver was rushed to a local trauma center with moderate injuries.